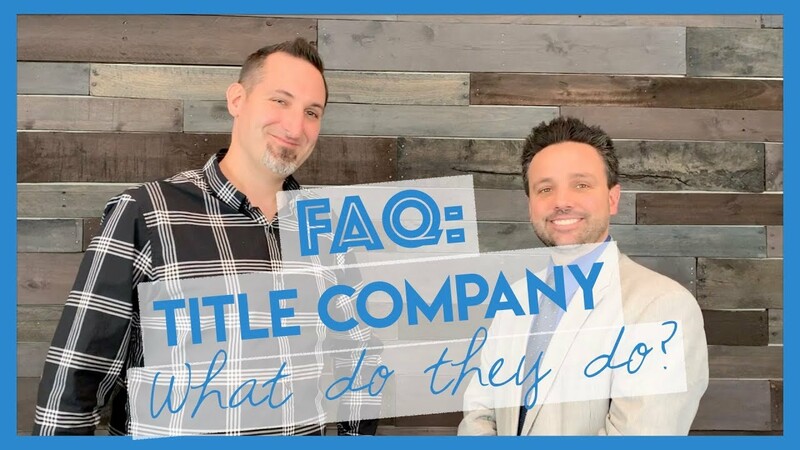 Have you ever wondered, “What they heck does the title company do” when you’re buying or selling a home? Great! My buddy Joey and I were talking the other day and thought it might be helpful if we took some time to chat about the ESSENTIAL, 3rd leg of the every real estate transaction. You’re not going to want to miss this one! Title companies have two main functions. Check the chain of title. Primarily, we are in charge of the funds. Essentially buyer paying seller, and any applicable loan pay off on the seller’s behalf. Part of managing the funds is ensuring that all other associated fees are paid, such as the county transfer and recordation taxes. We manage all of the funds and make sure they are distributed accordingly, down to the last cent. Or, someone that might claim a financial interest against the property. For instance, a contractor or someone who did work on etc property. In some cases the contractor may have place a lien against the property if owed money. The title company checks the land records and insure all of that is take care of in time for settlement. The tile company helps ensure that the seller can sell the property and has the right to sell the property to the new buyer. A lender, agent and the title company are involved in every real estate transaction. The title company is the essential third leg of the triangle, making sure that the buyer and seller get from contract to close. A neutral third party — the intermediary — honoring the integrity of the transaction.